Bring the magical world of The Nutcracker home this festive season by drumming up our fantastic ballet-themed bakes. Just take a few of our top quality cake tins, follow our step-by-steps and finish with a sprinkle of imagination! Made using our 11cm, 15cm and 20cm Loose-Based Deep Round Cake Tins. Preheat oven to 160˚C/Gas 3 and line and grease your 20cm, 15cm and 11cm tins. Make your cakes in three separate batches. For each, cream the butter and sugar together and add the eggs gradually. Mix in the flour and beat for 2 minutes. Pour your cake mix into each tin and bake the 20cm cake for 50 minutes, the 15cm one for 40 minutes and the 11cm one for 30 minutes, or until a skewer inserted into the centre of each cake comes out clean. Turn the cakes out onto a wire cooling rack and leave to cool completely. Once fully cool, crumb coat each with the vanilla frosting. Put in the fridge for the frosting to set for about 5 minutes. Cover each cake with white ready-to-roll icing, reserving enough white icing (about 200g) to make the rope decoration. Stack the tiers on top of one another and let the white icing harden a little. 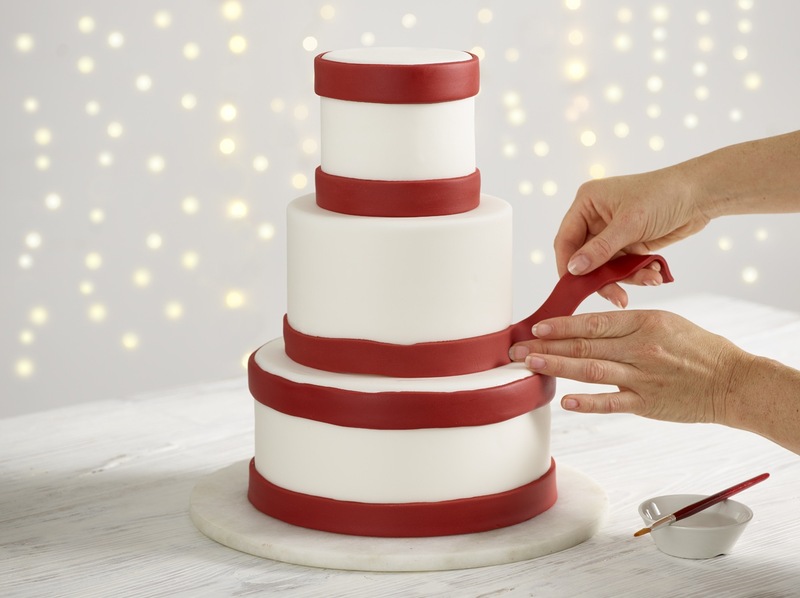 Roll out the red icing and cut it into six strips, each about 2.5cm/1” high and long enough to wrap around the bottom and top of each tier. 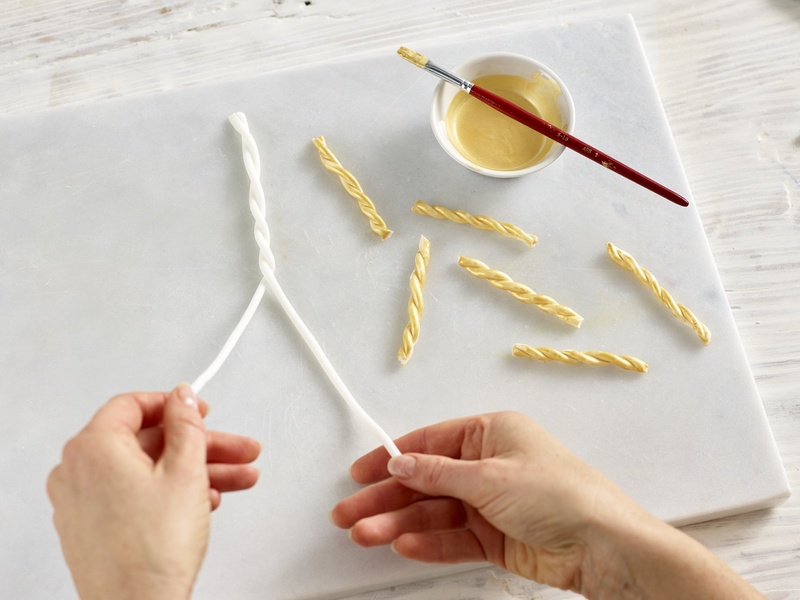 Using the edible glue, attach two strips to each tier. 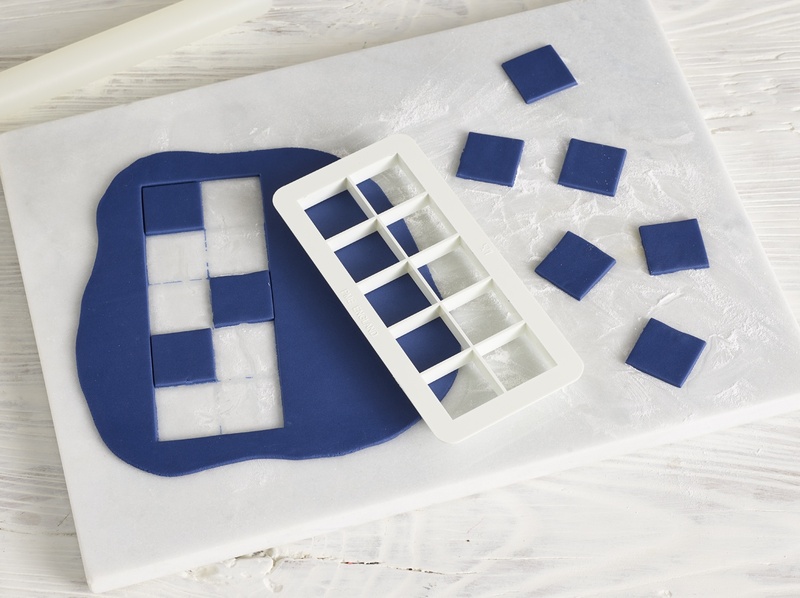 Using the medium-sized square geometric cutter, cut enough squares to go around each tier in the navy icing. Stick these in between the red strips in a diamond pattern. Add a pinch of Tylo powder to your reserved white icing and knead it in. Then, working quickly to prevent the icing from drying out, roll long sausages about 5mm thick, and add a little edible glue to both. Twist two lengths together to achieve the rope effect, then cut to length and leave to dry until completely hard. Once hardened, mix some of the gold edible silk with a drop of food-grade alcohol or clear spirit (vodka or gin will do) to make a paint. Using the brushes, paint the gold onto each piece of rope. Immediately spray with the gold glitter pump and again leave to dry. 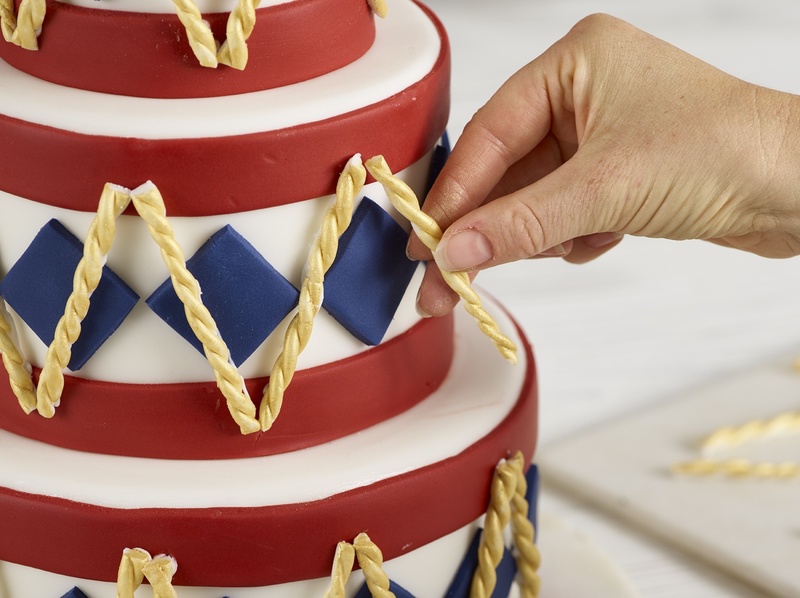 Attach the rope in a zigzag pattern going around the cake, making sure the joins are neat. Roll and cut thin strips of black icing about 2cm long and 5mm thick, then attach over each of the rope joins to hide any imperfections. Once finished, top with the nutcracker cake topper.